Avoid Christmas Crises - Keep your pets safe over the holiday! Sadly, at Christmas we see a lot of animals who have eaten things they shouldn’t - and owners who have to make an emergency trip to see us! Now, we do love seeing you and your animals, but we’d very much like it to be for checkups and boosters, rather than because they are at risk of critical illness. So, in this blog we’re going to look at some of the more common problems we see at this time of year, so that you can avoid them! I’m sure most of us are aware that chocolate isn’t good for dogs. However, the message hasn’t yet got to our pets… Both dogs and cats! Chocolate contains a substance called theobromine that acts as a stimulant (it’s quite similar to caffeine, which is also toxic to pets). The symptoms include vomiting, diarrhoea, restlessness, tremors, and even convulsions or seizures. However, fortunately, theobromine is relatively slowly absorbed from the stomach so if you can get them to us fast enough, there’s a good chance we can empty their stomach before any symptoms arise! 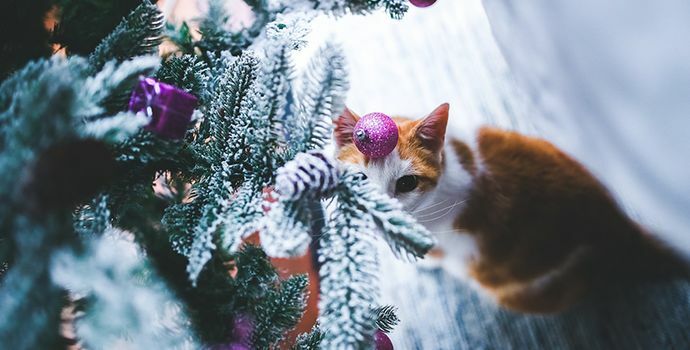 Found in Christmas cake, pudding, mince pies and much more, all the “vine fruits” can cause kidney failure in dogs and, probably, cats and ferrets too. However, the toxic ingredient isn’t well understood - some dogs may eat a bunch of grapes and be fine, and then eat three or four raisins and then go into kidney failure. Our advice - don’t let them get hold of any, and call us if they do! While most nuts aren’t actually poisonous, they’re often salted (which can result in salt poisoning). In addition, macadamia nuts are toxic to dogs, causing a range of odd effects including vomiting, wobbliness and a rise in body temperature - although this isn’t usually dangerous, it is quite unpleasant! Most animals don’t tolerate alcohol as well as we do! So, while your dog might love the thought of beer or wine, don’t give it to them – and make sure they can’t access it any other way, for example, leaving a drink somewhere it can be knocked over and lapped up (also, hops aren’t healthy for dogs either). The artificial sweetener xylitol (commonly found in sugar free gum, low calorie baking, and sugar-free peanut butter) is really dangerous to dogs, triggering a rapid drop in blood sugar levels. These members of the allium family have the capacity to damage red blood cells if eaten - so no sage-and-onion stuffing! Once again, humans can break them down safely, pets cannot. If you want to feed garlic for health reasons, make sure it’s pet-safe garlic (which has the toxin removed). Bones - cooked poultry bones tend to splinter when eaten, and fracture into razor-sharp shards. These can easily penetrate the soft tissues of the mouth and gut, resulting in internal injuries. Never feed any turkey with bones in to your pets! Rich food - turkey, veg and gravy are lovely - but your pets probably aren’t used to such rich food. This usually results in a very messy Christmas, as vomiting and diarrhoea can follow. As a result, while we have no problem with you giving your pets a treat on Christmas Day, don’t give them too much! If your pet does manage to get into anything they shouldn’t - don’t panic, just give us a call! We’ll have our own vets and nurses on duty throughout the Christmas period, ready to take care of your animals if needed. Even if you’re not sure if it’s a problem - phone us up and we can give you advice over the phone! We’d like to wish all of our patients and their families a very merry, peaceful and healthy Christmas!